Holmes V Slater - The battle of the fullbacks. Slater's injuries have stunted his performance this year while Holmes has barely put a foot wrong and has really shone this season. Should be an interesting battle here. 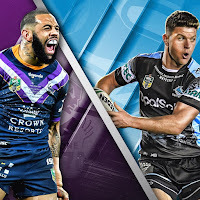 Townsend V Munster - Although Moylan is technically up against Munster, Townsend will need to stand up like he did last week and take control of the game, even in an understated way if the Sharks are to prevail.Fafita Vs Asofa-Solomona - With Gallen and Graham out, alot will fall on Fafita's shoulders to win the day.